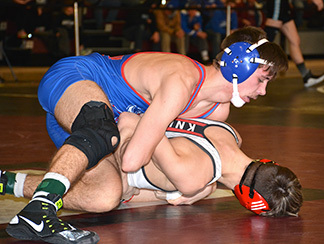 Decorah sophomore Jackson Rolfs was crowned the District 5 champion at 132 pounds Saturday to punch his first ticket to state. The dream of being a state champion remains alive for three Decorah grapplers, following Saturday’s Class 2A District 5 action hosted at Independence High School. Junior No. 7 Jackson Rolfs (132 pounds), junior Dawson Palmer (182 pounds) and senior Andy Murphy (195 pounds) survived tough brackets. Rolfs managed to punch his ticket as the district champion while Palmer and Murphy finished second. Freshman Austin Wilkins suffered tough losses Saturday to conclude his season. As 220-pound champion, Turkey Valley senior Carter Reicks punched his ticket to state as a member of the combined New Hampton/Turkey Valley squad. The first stop to state — the sectional meet — was Saturday, Feb. 2. South Winn had three grapplers finish in the top-two at sectionals to move on to the district, which was held at Denver High School in Denver. Turkey Valley senior Carter Reicks made the road to state look nearly effortless at 220 pounds. The Chickasaw took his first step toward Des Moines by throwing Daniel Graves of Dike-New Hartford in 3:59. Needing one more win, Reicks closed out the district competition as the 220-pound champion with a 10-6 decision over Wyatt Scheidel of Crestwood for his inaugural bid to state. With a 38-7 season record, Reicks will do battle with Wyatt Folkerts of Hampton-Dumont (30-12) in the first round Thursday.